Products Choose an optionXP-endo Shaper,#30, 21mmXP-endo Shaper,#30, 25mmXP-endo Shaper sequence Plus 25mm. Through a constant process of innovation and improvements, FKG has been working to ensure it can offer practitioners instruments capable of meeting all these requirements. With the creation of the exclusive MaxWire® alloy, FKG is bringing two fundamental properties to the forefront: superelasticity and shape memory, with the aim of creating a completely new generation of instruments. Unlike other instruments, these are able to react to variations in temperature and to take on a predetermined shape inside the root canal, at body temperature. Their specific preset shape and their extreme flexibility enables these instruments to contract and expand within the canal itself, and to reach areas which conventional instruments simply cannot access. Furthermore, their small ISO diameter and their narrow taper give them extreme resistance to cyclic fatigue. These factors enable this new technology to provide treatment for extremely complex root canal morphology, simply and efficiently, whilst being able to preserve the canal structure to a remarkable extent. Made with MaxWire® alloy, like the XP-endo Finisher, it offers remarkable flexibility and fatigue resistance, and the ability to progress within the canals with ease and agility, expanding or contracting according to the canal morphology. With an initial taper of .01, the XP-endo Shaper expands once inside the canal, achieving a taper of at least .04. Thanks to the Booster Tip (BT), the XP-endo Shaper benefits from a unique geometry, having six cutting edges at the tip. The BT tip respects the trajectory of the canal, whilst removing more material with each pass. It enables the instrument to start shaping an ISO diameter smaller than the one of the instrument. In the case of the XP-endo Shaper, the BT enables it to start shaping after a glide path of at least ISO 15, and to gradually increase its working field to achieve an ISO 30. + Six cutting edges for optimal guidance. + Starts shaping at minimum ISO diameter 15 to achieve a final diameter of ISO 30 with only one instrument. + Superelasticity, extreme flexibility and agility of the instrument. + Shape memory principles enabling the instrument to take on a predefined shape at 35°C. + Ability to expand within the root canal. The MaxWire® and Booster Tip technologies combine to make the XP-endo Shaper a “One File Shaper”. It has the ability to start shaping at ISO diameter 15 and to achieve ISO diameter 30, but also to increase the taper from .01 to at least .04. It allows to reach a final canal preparation of minimum 30/.04 and this with only one instrument. The XP-endo Shaper is the instrument of choice for the treatment of the vast majority of canals. Minimal stress is applied to the dentine walls and the risk of micro-cracks in the dentine is minimised due to support from the spring action against the walls. Micro-debris that are created are easily and efficiently removed, thanks to the turbulence generated by the instrument and the available space compared to instruments with a larger core diameter. Excellent resistance to cyclic fatigue. A gentle, non-aggressive and conservative treatment. Thanks to this unique instrument, treatment is easier to perform, treatment time is shorter, the risk of errors and incidents are radically reduced and the root structure is preserved. 1. Prior to using the XP-endo® Shaper, establish glide path to at least 15/.02. In calcified/constricted canals or complex curvatures, a glide path to 10/.04 is recommended. 2. Insert the tip of the XP-endo® Shaper into the canal (Fig. A), retract slightly and engage the handpiece in rotation mode. The canal and the pulp chamber should always contain irrigant. 3. Use gentle strokes to progress down to working length (WL) (Fig. B); disengage after each stroke. If WL is not reached in 3 to 5 strokes, stop, irrigate, recapitulate and proceed again with XP-endo® Shaper. Never force the instrument and always keep it spinning and moving while in the canal. 4. Once WL is reached, irrigate and work the instrument in long in and out gentle movements to WL for another 10 strokes (Fig. C). The final apical dimension is now at least 30/.04. 5. Irrigate the canal in order to eliminate suspended debris. 6. Confirm the final apical dimension with a 30/.04 gutta percha point. 7. If a larger preparation is required, use an appropriate Race instrument to obtain the desired final preparation. 8. Apply your regular irrigation protocol. Final cleaning with XP-endo® Finisher is recommended. 9. Obturate with gutta percha and sealer. TotalFill® BC PointsTM and TotalFill® BC SealerTM are recommended. 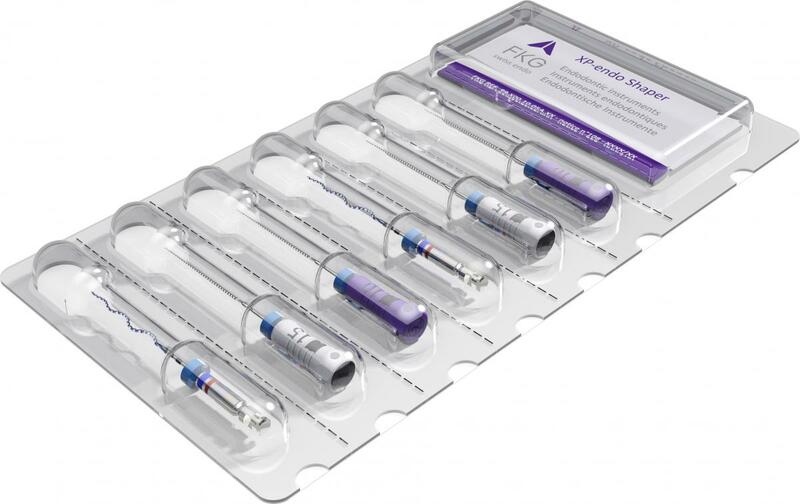 XP-endo® Shaper Plus sequence, Blister packs 4 instruments ( 1 sequence) for comprehensive treatment, from glide path to canal cleaning, as well as excellent shaping. (K File 10 + K File 15 + XP-endo Shaper + XP-endo Finisher). 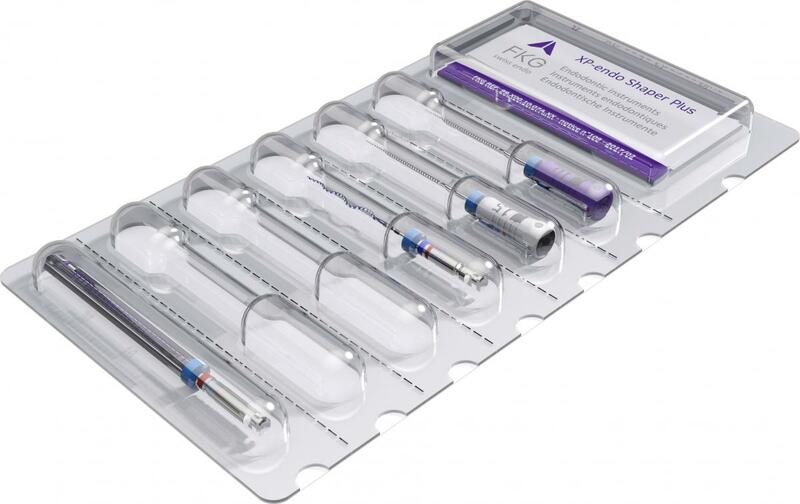 XP-endo® Shaper sequence, Blister packs of 6 instruments (2 sequences).